1. Mix together the yoghurt, garlic, lime, smoked paprika, cayenne, ground coriander and the honey and season well. 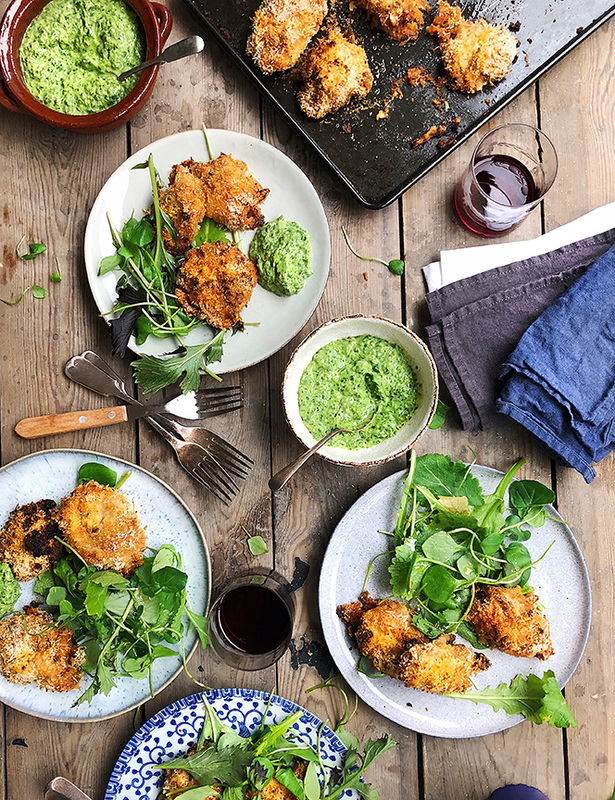 You can either half the chicken thighs if you are serving them more as a small bite, or keep them whole – place in the yoghurt mixture and make sure it is all coated. Cover and place in the fridge from 30 mins to over night (the longer the better). 2. Make the dip. Put all the ingredients into the food processor and blitz, place to one side till needed. 3. Heat the oven to 220c. Place the panko crumbs in a bowl and season well. Take a piece of chicken and roll in the panko mixture then place on a baking sheet, repeat for the rest of the chicken. Drizzle with olive oil and place in the oven for 20 minutes, till cooked through and nicely golden brown. Serve straight away with the dip and salad.